As a photographer, I love to enter photo contests. I really do! It's fun and exhilarating to put my work out there and I always learn something about myself or my body of work work when I look at it as a whole. Then I painstakingly try to pair the entries down to a handful of images. I've entered many contests over the years and while a handful of photos have won or placed, most did not. I always wondered what happened to those images, and why didn't they place. Maybe they were really close winning, or maybe they were far from it. I'll never really know? Did they inspire ANYONE? Birth Becomes Her has hosted four contests now, and I'm behind the scenes in each one. I see all of your work come through our email and I think of you as I add your photos to our pages. I see you. I see how brave you are, and how hard it is for you to pick images, to agonize over your body of work and to pay the entry fee and to submit an image. I see you, because I am you. As a judge, I keep my thoughts and opinions to myself mostly, but there's so much that I want to say. When an image that I upload sparks inspiration in me, I want to reach out to the photographer and say, "holy cow, this is amazing!" I want to ask you how you got the shot? I want you to tell me more about the story behind the birth. I want to show your photo to everyone who loves birth and I want to say, 'look at this shot, it's incredible!' (and sometimes I do!). What I'm trying to say is that I'm not 'just' uploading your images - I'm looking at you, and I'm inspired by you. Even if you didn't place, or make it very far, I can truly say that myself, Monet, Lindsey and the rest of the judges saw you, and we saw you shining your light. Thank you. I want to share some of our favorite images from our Birth Becomes Her Contest. The winners are all amazing, and so many other photos entered are amazing too. I also want to share some tips that I've learned over the years of judging our contests. The next time you submit, maybe this will make you feel more confident and positive. It's hard to be a contestant, it's hard to be a judge, and it's really hard to run a contest! We are so grateful for each of our judges and we are grateful for each of you. Then read them again, and again, and maybe one more time before you submit! Double check that you have images sized correctly and that you've included all of the information necessary. Do you need a title? Do you have your business name correct as you'd like to see it? No spelling errors? Watermarks? Model releases included? Do not hit "Submit" until you are SURE you are ready to submit! Titles matter! The title is a little window into the story of the photo. Images that are titled well, tend to go farther in the contests that we've hosted. Laura Wando's, "Before the Cut" is simple and perfect, we know exactly what's going on in the image before we even look at the photo. Gabriella Hunt's Breastfeeding image, "A Hush Fell Over The Crowd" is the perfect title for this mom, nursing in public in her bathing suit, in the bleachers. Here are some of my other favorites with awesome titles, paired with incredible images. This title is really captivating; not only is she in the midst of the 'contraction storm', but she looks like she's in the eye of a storm visually. It draws you in, with just the title and a glance at the image! "I Spy A Future Midwife" by Jenny Gullen. Another great title for a great image. You DO spy a future midwife, you know exactly how excited this big sister is and how engrossed in the process she is. The winning images definitely told a story. Marjike's winning image is a photo that you can't stop looking at, there is so much going on in one shot. The winning images had captivating titles and images that told a story and made the viewer want to know more. Here are a few other images that told a story that really spoke to me. This image was one of my most favorite shots from the contest, and it also happened to be one of Monet's favorites as well. We both just love big sister's connection with the camera, her glasses and of course that perfectly pink baby brother. I can't stop looking at it! As a cesarean mom who felt a lot of disconnect with my birth, seeing images like this, it give me a little window inside what my birth would have been like and what my body might have looked like. This image is healing for me. Any image you submit to a contest should be in focus, sharp, and should have a clear subject. Often we'll see a great photo and the focus is missed and it's obvious. Be sure to send in photos that are technically correct! It's fine to break the rules sometimes, but you need to know the rules first. This image is tack sharp. The aperture was open just enough to still provide us with a shallow depth of field, however still ensure that the subject was in focus. The colors are spot on. The shadow on the left side of the image is dark enough for a nice dramatic feel, but still shows detail at the edge of the towel. 5. Hit me with all the emotion! I want to FEEL it, instantly. Just like I do with Veronika's winning Postpartum image "This is VBAC" and Lacey's vulnerable selfie, "Rebirth." Both of those images resonated with me and both of those images resonated with the judges. Here are a few other images that I really 'felt' instantly and because of that, I voted for them. The wrinkly forehead and closed eyes of that baby, and then the mama kiss. Ahhhhhhh......lovelovelove! I remember that wrinkly forehead and sleepy expression. I gave my babies ALL the kisses. This takes me right back to postpartum. I freaking love it. This is everything! My eye goes straight to mom's face, then the way her arm is holding the baby, her head is cocked with her chin resting on the baby's head. It's perfection just with that alone. But then I see dad's face and his hands cradling baby the water droplets, the cord! Wow, wow, wow! This just melts my heart. Her edit is perfection, but this shot also grabs me emotionally too. That wide eyed babe and mom's lips parted in a sigh of relief. Holy smokes, so so good Stephanie! A good edit is just as necessary as an image being well focused and well composed. Take a moment to check out the winning images. The images that were in color were vibrant, rich and had gorgeous edits! I love the all the shades of pinks in Cory Janiak's breastfeeding image. The earthy tones of Rebecca Coursey-Rugh's labor image drew me right in. One of my favorite edits of the contest is Jen Conway's winning maternity image, mom's perfect skin tone and the gorgeous greens and blues - it's just stunning! The colors and tones draw me right in - the gorgeous pink baby, the blue tones and mom's belly and arm. It's really, really beautiful. I'm not sure if people appreciated the difficulty of this shot. It's a very dark room, with natural lighting, she nails focus and her edit is really compelling! The colors and earthy tones of the image and the reflection of the light in the water is just beautiful. This is one of my favorites from the entire contest. Again, take a minute to look at the winning images. The black and white conversions had crisp whites and true blacks. There is a good complexity of tone, even though the image is in black and white. I want to see detail in both the blacks and whites in the conversion. I also want to see an image that is enhanced by the black and white conversion and thoughtfully converted. 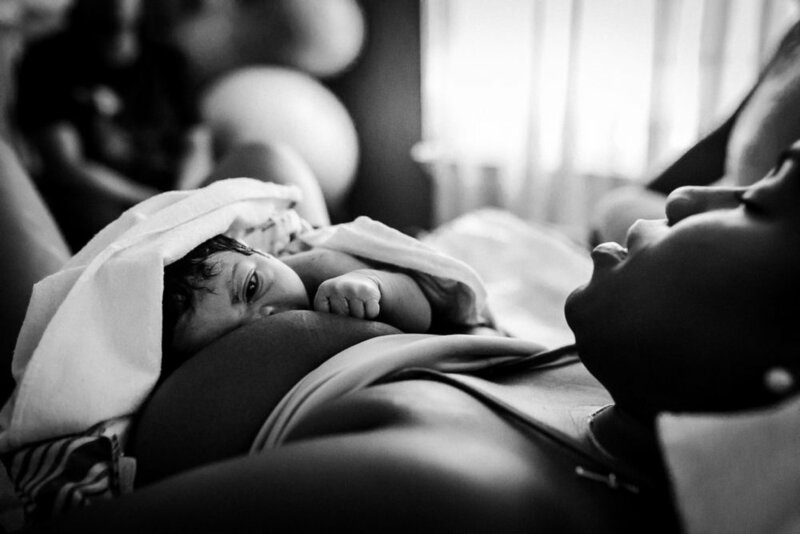 Selena Rollason's winning birth image had gorgeous whites and highlights and her conversion enhances the image. 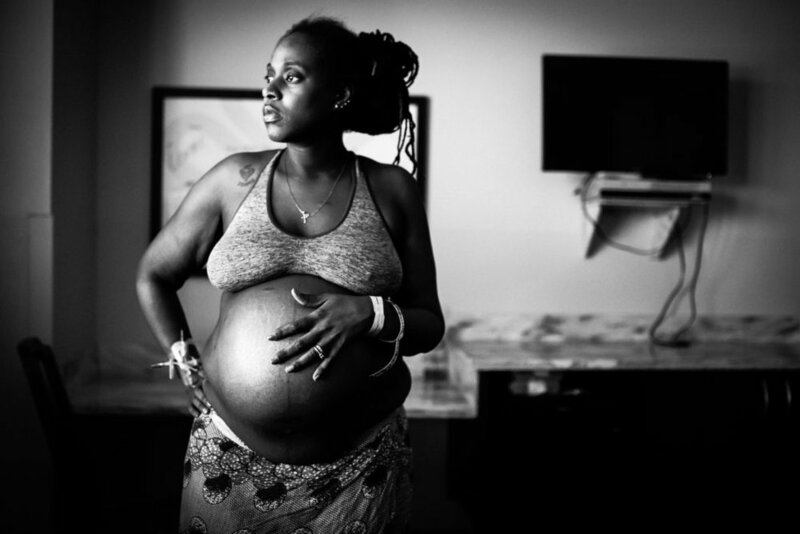 Kayla Gonzales's postpartum shot was a beautiful clean edit with true blacks and whites - perfectly edited. Vanessa Mendez uses the back-lighting to perfectly create tonal range in her BW conversion. When there isn't a good complexity of tone, the images come across gray and dull and they don't go far in the contest because they don't stand out. Here are a few other awesome black and white conversions that I loved. The edit here is really beautful. The highlights on her face and the deep shadows on her belly really make the photo multi dimensional. This photo is not only a wonderful black and white conversion, but it tells a story, the composition is wonderful and its PACKED full of emotion! Good composition is so compelling! Look at the way images that you love fill the frame. It's not just about the rule of thirds or rule of odds, and rigid subject placement - composition directs your eye to the subject and through the image to help you tell the story. Composition gives you framing and depth. The use of negative space is like poetry and enhances the image, drawing you to the subject. The winning images show us wonderful examples of compelling composition. The perfect example of this is Ashley Marston's second place labor image, I love her use of negative space. Rebecca Coursey-Rugh photos are always intentionally and stunningly composed. Here are some other images where the composition really stands out and drew me in. The use of negative space is stunning and really makes the photo stand out. I love how this photo fills the frame, first I see her face, then her hand gripping dad, then I'm drawn up to the nurse and the clock. I love the wide angle - and how flattering this image is of mom even in such an intense moment. She looks beatufiul! Not only is this a gorgeous photo that makes me feel, and it's a beautiful BW conversion, but it's also really well composed. The composition from mom's peaceful facial expression to her child's hand on her neck and her own hand resting on her belly. You look through the image and study it. It makes me stop and pause. That's what good composition does for the eye. I often see gorgeous images submitted from the same birth or same session that are very similar. The problem with this is the judges probably won't vote for both, so they pick between the two - and their votes are often split. We see this quite a lot actually. If you can't decide, then ask for opinions on your page and in groups. See which one is the more popular, or go with your gut and just enter your favorite. If you are going to enter two from the same session, make sure they are very different from each other. A unique photo and perspective always stands out to me. I love seeing those people that push the boundaries, break the rules and dare to be different. I see you and I think you are awesome! I love it when people break out of the box! Show me something I've never seen before - show me something different! This shot is unique and it stood right out to me. It's also really well titled - the intentional motion blur, her stillness and her bra. SO good. I love something that I haven't seen before and this is creative and unique! This is super abstract, really creative, and edited in a very beautiful way. This is certainly one of my favorites from the contest. The Birth Becomes Her contest was published in over 25 countries and it reached millions of people. Even if you didn't win, your photos were seen and they were admired. The contest images still gets over 1,000 views daily. Images get clicked on in the gallery and people are still viewing your work. Thank you!